Chateau Grillet has quite a long history, as it was cultivated first by the Ancient Romans. There are old ruins of the Roman community within walking distance of the property. 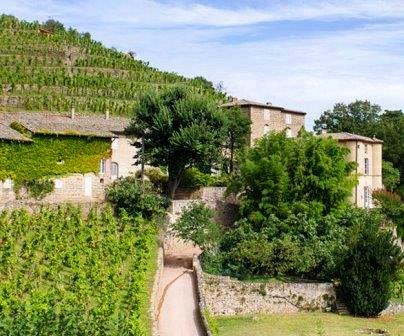 Chateau Grillet takes its name from the hillsides that are roasted by the intense heat of the sun. Chateau Grillet was so well-known in the 18th century, that Thomas Jefferson, the third president of the United States visited the estate in 1787. Chateau Grillet bears another distinction, it was one of the first wineries in the Rhone Valley to produce, bottle and sell their own wines starting in 1830! Chateau Grillet was purchased by the Neyret-Gachet family in 1827. The Neyret-Gachet family continued to own the estate until 2011. Chateau Grillet is one of the world’s most interesting for several reasons. First, only one grape is allowed by law to be planted in the vineyards, Viognier. Next, only one producer occupies the entire region and perforce, owns the only vineyard and makes the only wine in the appellation and lastly, the wine and the appellation share the same name, Chateau Grillet. The appellation of Chateau Grillet was granted official appellation status in 1936, when the property was managed by Henri Gachet. In 1976, Chateau Grillet was declared a National Heritage site. The appellation, vineyard and winery was sold by Isabelle Baratin in 2011. Chateau Grillet had been in her family since 1825, when it was first owned by the Neyret-Gachet family. The property was purchased by Francois Pinault, the owner of Chateau Latour in Pauillac in 2011, through his Artemis holding company. Following the purchase of the property by the Artemis group, to help combat counterfeiting, Chateau Grillet adopted the prooftag system, allowing consumers to track the authenticity of their bottles on the estates website. In 2012, the winemaking facilities were completely renovated and a new vat room was created with the addition of modern, stainless steel fermentation vats. 2012 brought another change to the estate when Alessandro Noli was placed in charge of the winemaking. Chateau Grillet is located in the Northern Rhone Valley, adjacent to Condrieu. Both appellations are famous for their plantings of Viognier. Today, Viognier is enjoying a moderate resurgence in popularity. This is a good things because it was not all that long ago with Viognier was almost extinct. Think about it. In 1982, Condrieu was a mere 14 hectares of vines. Aside from the Viognier planted in the nearby appellation of Chateau Grillet, there were almost no other vineyards with Viognier planted in the world! Today, Condrieu has close to 135 hectares planted with vines! When you add the vineyards of Chateau Grillet and the vines placed in Cote Rotie, that is quite a difference from what we saw in 1982! The Chateau Grillet appellation is a miniscule 3.5 hectares of vines. If you think 3.5 hectares is small, prior to 1971, only 1.7 hectares were under vine, making Chateau Grillet the smallest appellation in France at the time. The tiny, 3.5 hectare vineyard of Chateau Grillet has a terroir of granite with quartz, micas sand and clay soils. The vineyard is planted to 100% Viognier. On average the vines are 45 years of age. The vineyard is planted on 76 steep terraces with a south facing exposure that look like they would be close to impossible to farm. The terraces, which are prone to erosion are continually reinforced by a series of rock and stone walls that need almost continuous attention. To produce the wine of Chateau Grillet, the grapes from each parcel are vinified on a parcel by parcel basis in small, steel tanks. Malolactic fermentations can take place in tank or either tanks or French oak barrels, depending on the needs of each parcel. The wine is then aged for an average of 20% new, French oak barrels for about 18 months before bottling. Chateau Grillet, unlike its cousin in Condrieu, has the unique ability to age for decades. Even though Chateau Grillet and Condrieu are both planted to 100% Viognier, the styles of wine are quite different. You find more sweetness with fatter textures in Condrieu and perhaps more minerality, elegance and the ability to age in the wines of Chateau Grillet. Chateau Grillet also produces an entry level wine made from 100% Viognier, Pontcin, which comes from vines they own that even though they are contiguous with the property, because they are not considered part of their tiny appellation, they are considered part of the Cotes du Rhone appellation, which is of course how they are sold. Lush, rich, unctuous and lower in acidity than the 2 previous recent vintages under the new regime, the wine is concentrated, ripe, fresh and packs a punch with its mineral driven, floral, citrus character. The wine is long and leaves a good impression on the palate and in the finish. A beautiful wine in every sense of the word. Fresh, bright, mineral driven, long, rich and concentrated with layers of honeysuckle, white peach, citrus rind, crushed rocks and a hint of tangerine. The first really strong vintage for the new owners, the Artemis Group is a knock out. Ripe, fresh, pure fruits, citrus, honeydew, flowers and mint notes really add to the nose. Rich, sweet, juicy, fleshy and vibrant with ample get up and go acidity to keeps things fresh. The debut vintage for the Artemis Group shows they are serious about the vineyard, as you would expect. The wine is fresh, concentrated with ripe, white and yellow fruits, crushed rocks and spring flowers. Lacking the density and same level of freshness of the subsequent vintages, this is still a very nice wine. Fully mature, the floral, honeysuckle, white peach, melon, citrus and crushed stone notes were out in full force. The wine has energy and a sweet, ripe, silky, fresh, mineral driven finish.